Welcome to Jones Apiaries – Maker of Fine Honey! The time has come for us to begin semi-retirement. We have sold our retail store list and some of the bee yards to Hilltop Apiaries, LLC of Canton, CT. Philip Moore is the owner and will be supplying honey to the stores where you once bought Jones’ Apiary honey. He is in the same geographic area and now owns some of our bee yards, so the honey is from the same sources. Jones’ Apiary will continue to sell equipment and nucs. Thank you for all your support and loyalty over the last 20 years. We have really enjoyed getting to know all our customers and hope you will give Philip Moore, Hilltop Apiaries, the same wonderful support you have given us. Thank you for all the opportunities. Ted and Becky Jones started out in the beekeeping field in the spring of 1972 when they were given a beehive as a wedding gift. In those days, it was a fun activity, supplied just enough honey for their own use and was a good topic of conversation. As the years went by, beekeeping was more along the lines of ‘bee having’. This meaning that the bees were taken care of when there was time. Along about the late 1980’s and early 1990’s the varroa mite attacked the honeybee population and the wild honeybee was decimated. At this point, Ted realized that he wanted to be more than a ‘bee haver’, so he started to seriously investigate the art a beekeeping. One thing lead to another, and before they knew it, both were enthralled with the wondrous world of honeybees. 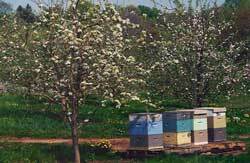 Taking courses in beekeeping through the Eastern Apicultural Society conferences and attending the CT Beekeepers Association state meetings, the love affair with the honeybee grew, as did the number of colonies. What was supposed to be a slow, methodical increase in the number of colonies turned into an explosion. (Honeybees tend to do their own thing.) From just a couple of hives in the early 90’s to around 200 by the year 2000, the beekeeping bug had taken hold. 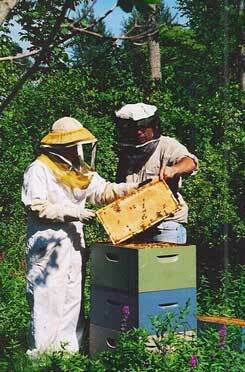 Establishing the business in the fall of 1997, the production of honey and pollination services was getting underway. Today, the business of beekeeping for pollination and honey production is continuing to expand. With very few wild colonies of honeybees left, the managed hives provide a vital link in the food chain. About 80% of your food depend on the honeybee for pollination. However, beekeeping is more than a part of the food chain, it is a love affair with the honey bee. Aside from the art of beekeeping, both have taken on active roles in the arena of beekeeping. Ted sis the past President of the CT Beekeepers Association, is the past Vice President/Program Chair and past Director to the Eastern Apiculture Society . Becky is the past Treasurer of the CT Beekeepers Association and past Director to the Eastern Apicultural Society of North America. Both have a strong commitment to the future of beekeeping.